Pneumatic Slide | Vertical Thruster | SCV | PHD, Inc.
Series SCV Pneumatic Thruster Slides new design 3/7 includes steel-backed composite bearings with oil wick providing improved performance, load capabilities, and unit weight reduction. 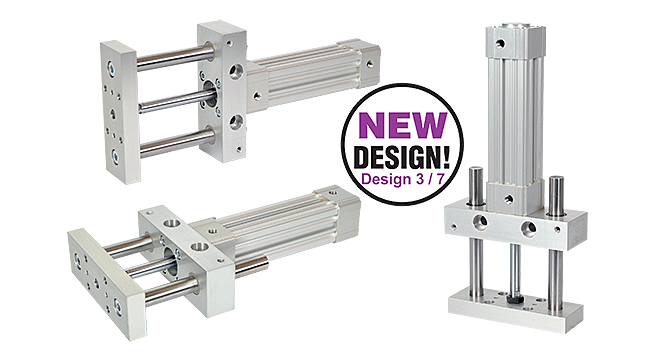 This slide features PHD CV Cylinders in a slide configuration with precision guide shafts and are available in 8 bore sizes to fit a wide variety of applications. The standard CV Cylinder options are available such as Rodlok, Port Controls, and Cushion Controls. Optional switches have been bundled to simplify ordering. Series SCV Slides are designed for vertical or non-rotating applications. Powered by PHD's rugged Series CV Cylinders, variety of sizes to suit a wide range of applications.